Mixed Martial Arts is a serious sport, one that teaches discipline and skill. MMA is not a casual sport that can be picked up and dropped; it requires dedication and a willingness to see it through. MMA can be a great sport to get into if you are serious about it and willing to exert the level of intensity required to be a good competitor. 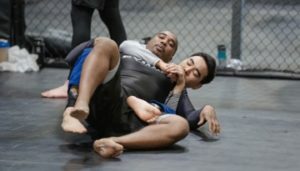 Finding a MMA gym in Houston is the first step, and from there you can discover the benefits of this competitive sport. Mixed martial arts is a great sport if you are looking to improve your coordination. When you are competing with just one other person, coordination is very important as every move you make is significant. Improvement in this sport does not come overnight. You may not even be able to accomplish certain moves for a long time. However, when you finally do, you will feel very accomplished and thankful that you stayed dedicated. When you start MMA training, you will quickly realize that being able to be resilient is just as important as physical strength. You will learn to accept defeat and learn from your weaknesses. MMA training is more than building muscle. You are learning moves that you will have to be able to put into practice in response to an opponent’s quick movements. You must be quick-thinking, and that is something that you will learn and get better at the more you train in this sport. MMA training helps to sharpen the mind. Because mixed martial arts involves every part of the body, it is a great sport to train in. While any sport will require overall fitness to be great at it, MMA requires the player to strengthen every muscle to perform their very best. It is also a great source of aerobic and anaerobic conditioning. Lastly, some may view MMA as a dangerous sport due to the level of intensity and perceived violence. However, MMA is largely considered even safer than boxing. It is important to remember that when you are competing or training in a gym, you are in a controlled environment with safety measures and regulations in place. When deciding if MMA is right for you, you may want to consider your other options. There are different types of popular combat and martial arts sports that you may be interested to know a bit more about. Boxing is a true classic sport, but it differs majorly from MMA in that it does not involve grappling or ground fighting. Boxing does, however, share a common thread with MMA in that both sports require quick thinking and the learning of specific maneuvers. Kickboxing is true to its name as a boxing sport that involves kicking in addition to boxing. Kickboxing can be a great sport to train in addition to MMA to strengthen core muscles. BJJ is a combination of martial art and combat sports. Brazilian Jiu Jitsu contains both grappling and ground fighting and is considered a part of MMA fighting. This is a good sport for those who have experience in other combat or martial arts sports and want to combine their skills. It’s also essential to know important BJJ moves even in mixed martial arts. There are some gyms that specialize and offer classes in combat sports like MMA, such as O Athletik. You can also take time to explore similar combat sports like boxing and brazilian jiu jitsu. If you are a parent with a child that may be interested in mixed martial arts, it may be a good idea to encourage their natural athletic abilities in kid programs. If you think that you would like to get fit and healthier before participating in an intense sport like MMA, consider making use of a personal trainer to help you prepare for the sport that you’re interested in. O Athletik also has a sports performance training facility designed to train athletes in the most effective ways. If you are ready to start your Houston MMA training, visit the O Athletik class schedule and discover your next favorite sport.